Click Web Services in the Configuration section. The Web Services screen displays. Click the General Information - Type drop-down arrow to select the type of data to be generated. In the Web Service Output Fields section, select the sections to be shown. The available sections will vary depending on the type of data being generated. Activity classifications can be made available for the Faculty Detail pages. If your institution wants activity classifications to be available, please contact FACULTY180 to have this activated. Faculty members can then specify if they want the activity classifications for each of their activities to display publicly on their profile page. Use the Data Filtering and Access to Web Service section to specify various options for the type of data being generated and to copy the code. Select the desired unit and employment status, if applicable. 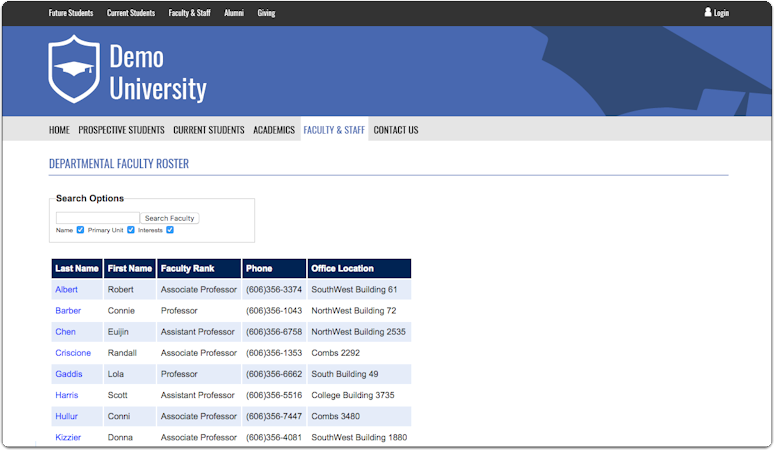 For the Faculty Directory Listing type, you must provide the applicable URL for your institution’s web site if your institution intends to use the Faculty Detail type for detailed faculty pages. 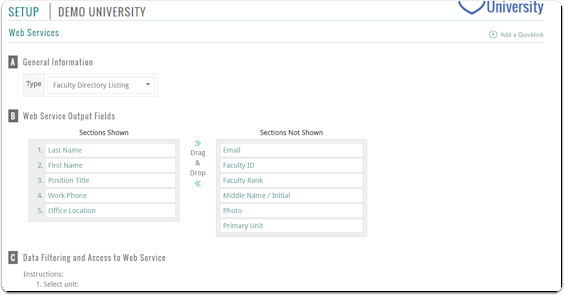 Your institution will need to make a template page on its web site for the faculty detailed page, and then insert the URL of that page in the Provide the URL for Individual Faculty Detail field. The detailed faculty pages are updated dynamically; therefore, it is not necessary to create new code and reinsert the code as changes are made, unless the URL for the template page changes. It is recommended that institutions work with their web site developer to create the template page and obtain the URL. Use the Searching arrow to specify if a search field should display on the listing page (not applicable to the Faculty Detail type). When you are finished, click the Select Code link, copy the code, then paste the code into the appropriate location on your institution’s web site.